Born from the need to provide sustainable, eco-friendly, and functional infant and toddler dishes, Avanchy is your one-stop shop for all parents wanting to make dinnertime a little easier and a lot friendlier! They offer a variety of bamboo and stainless steel tableware and utensils in eco-friendly, toxin-free materials for children ages four months to two years and up. Avanchy's vivid hues and playful website make browsing and shopping a breeze. 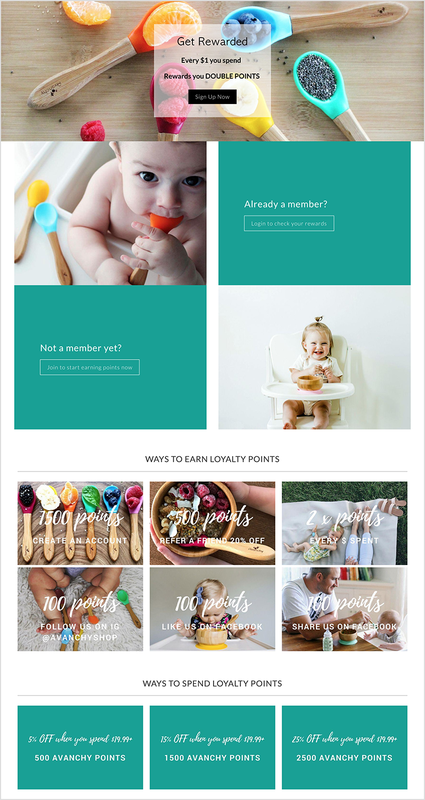 Their VIP Club loyalty program pops with color, showing fun images of their products and bold type displaying their rewards, enticing members to sign-up and become part of it all. Their use of Marsello to gather important customer feedback and tangible results means that they know what their customers need and are willing and able to deliver. All of Avanchy's members are considered VIP, which means all members receive two points for each dollar spent. Customers are also offered a generous 1500 points for creating an account, which means once they are members, they can immediately redeem a reward for fifteen percent off an order of $19.99 or more. This is a great initiative to get new members on board and incentivizes them to try out Avanchy's fantastic products right away. With customers already entitled to a 5% discount with just 500 points, new customers will find it hard to go past these amazing offers. Avanchy's generous loyalty info page is colorful, user-friendly and fun! They have plenty of images displaying their products and a clear outline of how their loyalty program works, including how to earn points, what you can redeem points for and their loyalty program FAQs. With registered customers earning points from the moment they sign-up, they are more and more likely to return to make a purchase and spend those previously accumulated points. Avanchy's loyalty explainer page is also incredibly detailed! They provide a comprehensive list of frequently asked questions to help their members navigate their way through the loyalty program. These FAQs explain how to use their loyalty program, how customers check their points balance, how to earn and redeem points, and how to troubleshoot for common issues, providing a seamless experience for all members. Avanchy's attention to detail and informative product listings help them to continually gain new customers. Their website is strikingly colorful yet straightforward to navigate, and their products are listed with detailed descriptions, giving potential customers essential details about what they're buying. Avanchy also make decision making easy on new customers by categorizing their products in age ranges. Avanchy has partnered with MyRegistry.com to create a gift registry where members can create and manage a list of products they desire to be shared with friends and family. This is a great idea for upcoming baby showers, birthdays, and special events. Avanchy have curated a beautiful, eye-catching and brand-complimentary Instagram page to show their customers exactly how great their products really are and to let them know when deals are occurring. On Avanchy's website homepage, customers can easily view images from the Instagram store and click on the images to shop for the products shown. This is simple and effective advertising at its best!